Which is the ugliest flower in the world? This question may seem very tough to answer. Because every single flower in the world has its own beauty. What else to say, when you hear the word ‘beautiful’, the first thing may come to your mind is flowers. Which is the most beautiful flower in the world? It is also as tough as the previous question. Because there are a lot. But if you look closely, you can understand that some flowers have a number of unique features to outrank the rest. Here the list of 10 most beautiful flowers in the world. You don’t actually need an explanation about this beautiful flower if you already an attendee of D.C’s National Cherry Blossom Festival. It is one of the most spectacular spring festivals in the country. 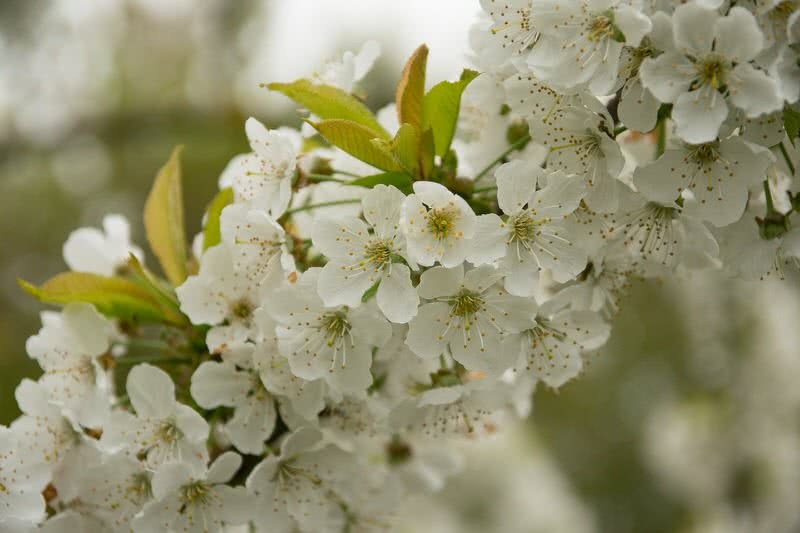 The festival showcases more than 3000 cherry trees in full bloom. This festival also commemorates a special day, March 27, 1912 – when Tokyo Mayor, Yukio Ozaki gave Japanese cherry trees to the U.S to strengthen the friendship between the countries. Are you wonder why this plant is so special? Nothing but the unique beauty of its blossoms. First of all, it’s a flower of any trees from the genus of ‘prunus’. The most popular one is Japanese cherry trees. In Japan, cherry blossoms are called ‘sakura’. Cherry blossoms symbolize the arrival of Spring, the season of flowers. The beautiful pink and white blossom open at the end of March or beginning of April. The blooming period can last for 14 days. Cherry blossoms have a great significance in Japanese culture. For them, the blooming of cherry blossoms represents a new beginning and beauty of life. During the blooming period, Japanese spend the evening under the full blooming cherry trees with family and friends. What else anyone possibly needs? It’s definitely a confusing name. 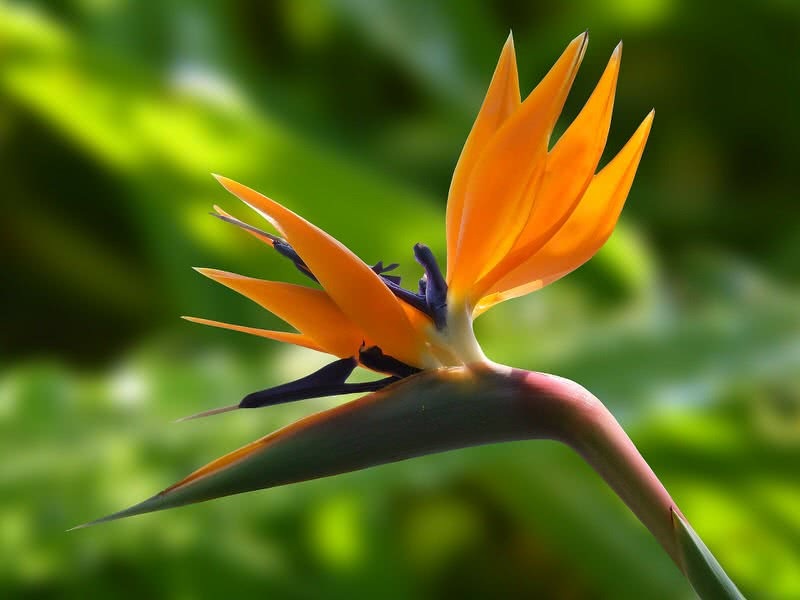 Actually, bird of paradise is an exotic plant native to South Africa. On blooming, its pretty flowers look exactly like the bird of paradise in flight. That’s why it named so. Bird of paradise is also called as crave flower. 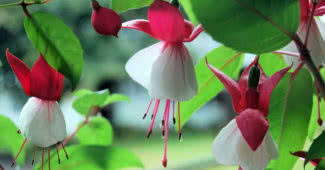 This unusually beautiful flower symbolizes the paradise itself. A mature bird of paradise plant bloom from May through September. On blooming, each flower has three, upright, orange-colored sepals and three, horizontal, blue, inner sepals. The plant also has long, green leaves. Altogether, this flower resembles a flying, bird of paradise, one of the most colorful birds in the world. Bird of paradise grows well in outdoors. It needs full sunshine. Once the flowers fade away, you should cut back the stems to encourage next level of blooming. You already know what a heart-shape represents – love. Now, imagine a plant in your garden with full of heart-shaped, pink-white colored flowers. Isn’t it wonderful? Of course, nobody can disagree. Because the bleeding heart is such a stunningly beautiful flower that can catch everyone’s attention. This beautiful, spring-blooming bleeding heart flower grows well in moist, cool climate. On blooming, up to 20 heart-shaped flowers would open on each arching stem. 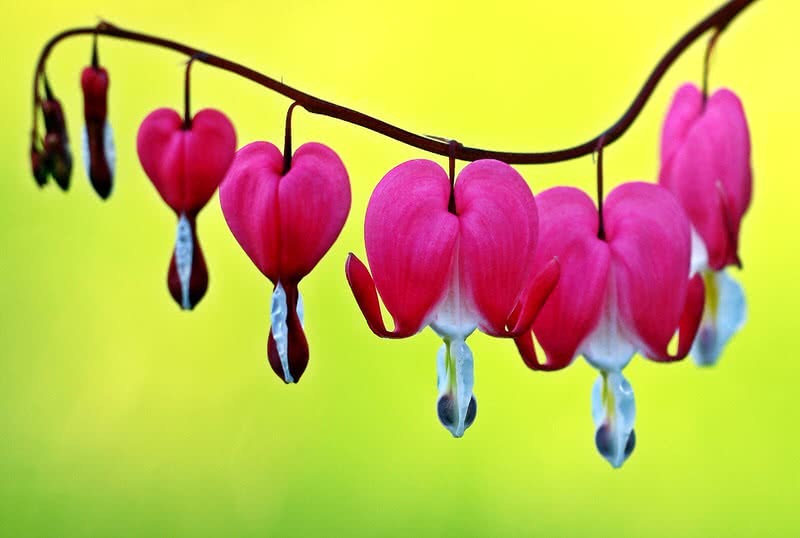 The bleeding heart can be found in pink, red, yellow and white colors. But pink outer petals with small white tips look more attractive. When small water drop appears at the tip of the flower(in a moisture filled atmosphere) these flowers truly look like bleeding hearts as their name suggests. Dahlia is always been so special among flower lovers. The reason is its great variety in size and color. 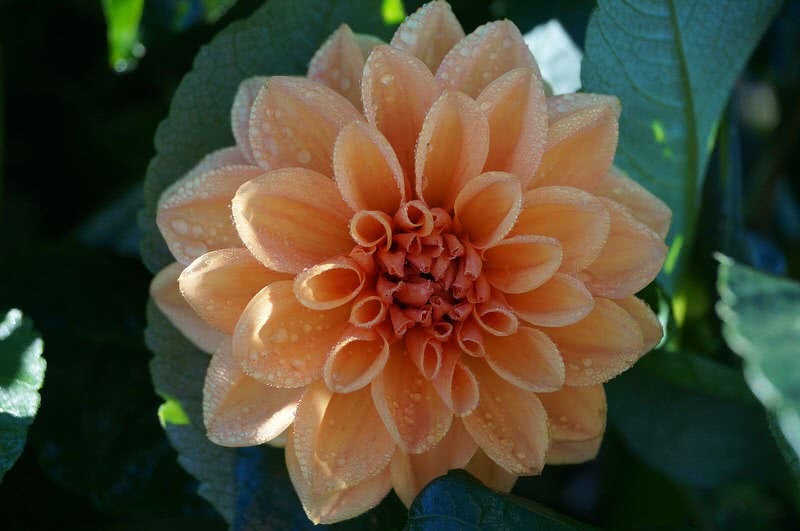 There are 42 different species of dahlias in the world. This beautiful flower comes in both small and large sizes, ranging from 2 inches to 20 inches in diameter. Dahlia also varies in color, can be found in almost any color except blue. Dahlia is native to Mexico. But today it is wildly cultivated. The stunningly colorful flowers bloom between mid-summer and first frost. To promote blooming, you need to cut back the stem after first flowers fade away. Probably the queen of all aquatic flowers in the world. To your surprise, there are 70 different types of water lilies in the world. They grow only in still, shallow freshwater ecosystems like ponds. Besides the attention grabbing beauty, water lilies also aid in protecting the ecosystem they inhabit by balancing the water temperature and providing excellent habitat for fishes. Apart from the eye-pleasing flowers, large leaves which float above the water surface are another noticeable thing about water lilies. They also have a long stem that attached to the bottom of the pond or lake in which the plant inhabit. The pretty flowers open from spring to fall. Like leaves, flowers emerge out of the water surface. Each flower opens in the morning and closes in the evening. 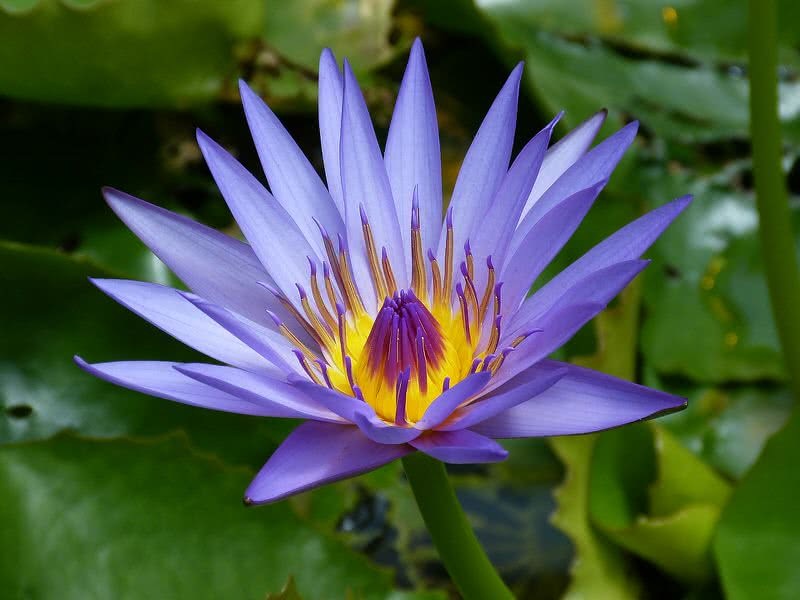 Water lilies come in different colors including pink, white, yellow, orange, purple and blue. 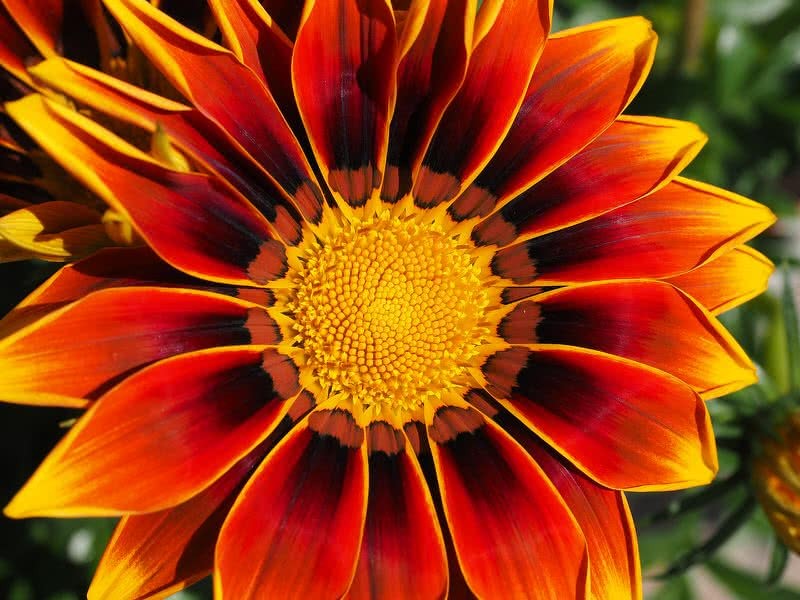 Gazania is a beautiful daisy look like flower native to South Africa. It is also known as treasure flower. Convincingly, gazania has pretty, brightly colored flowers and very attractive long, silver-green leaves. Gazania grows well in locations where they get full sunshine. Vividly-flowers start to appear in the mid-summer and continue through early fall. Gazanias open in vivid shades of orange, yellow, red, pink and white. As said earlier, gazania is a Sun-loving flower. Therefore, its flowers close in the evening and not open on the days when the temperature is very low. What would be your reaction on spotting a lotus in a murky pond? Of course an instant wow…! Would appear on your face. Regardless of how dirty the pond or grows, nobody could ignore the beauty of a lotus. It is a sacred flower for Buddhists and symbolizes purity, harmony, divinity, and grace. Lotus is one of the beautiful aquatic flowers that found in shallow, murky waters. They can’t survive in the cold climate. Lotus need full Sunshine for healthy growth. This light-sensitive flower opens in the morning and closes at night. The showy lotus flowers mainly found in pink and white colors. Each lotus has attractive, multi-layered petals with a central head. Both flowers and leaves float above the water surface. Lotuses can as large as 20 cm in diameter. Their perfectly round shaped leaves also grow up to 60 cm across. 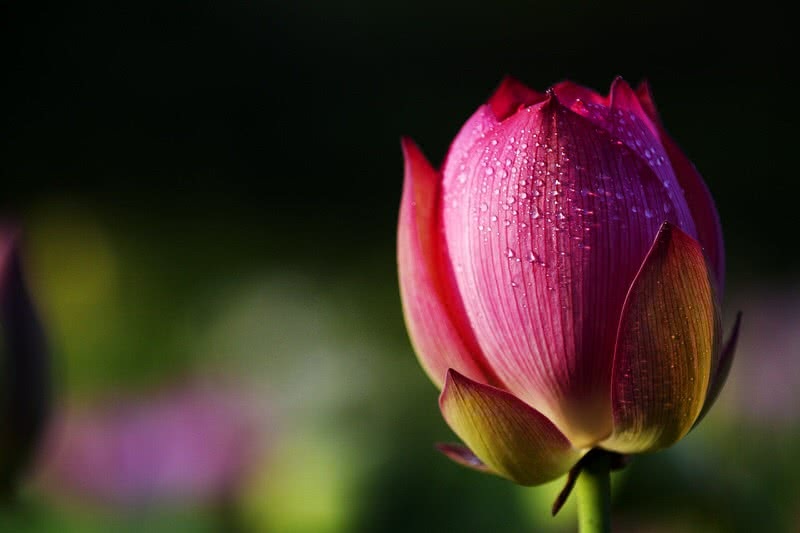 Apart from the beauty, lotuses are also known for their pleasant fragrance. As a great flower lover, you must have heard about the Keukenhof flower garden. Located in the Netherlands, this large garden spread across a vast land of 32 hectares. On each spring this garden displays millions of tulips in full bloom. Just imagine you stand between that vast fields of tulips. You would definitely feel like heaven. Because tulip is such a beautiful flower that could instantly grab your attention. 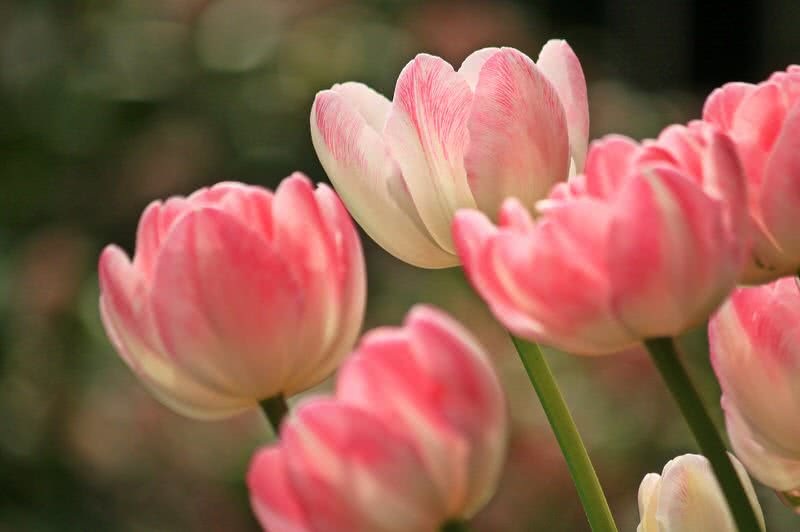 There are more than 3000 varieties of tulips from 150 different species in the world. This diversity itself make it as one of the most popular and most cultivated flowers in the world. The cup-shaped tulip flowers open on each spring. This showy flower comes in all shades of colors except pure blue. Normally, each stem of a tulip has only one flower. But some species of tulips have more than one flowers on a single stem. One sad fact about tulips are their short lifecycle, only open for 5-7 days. 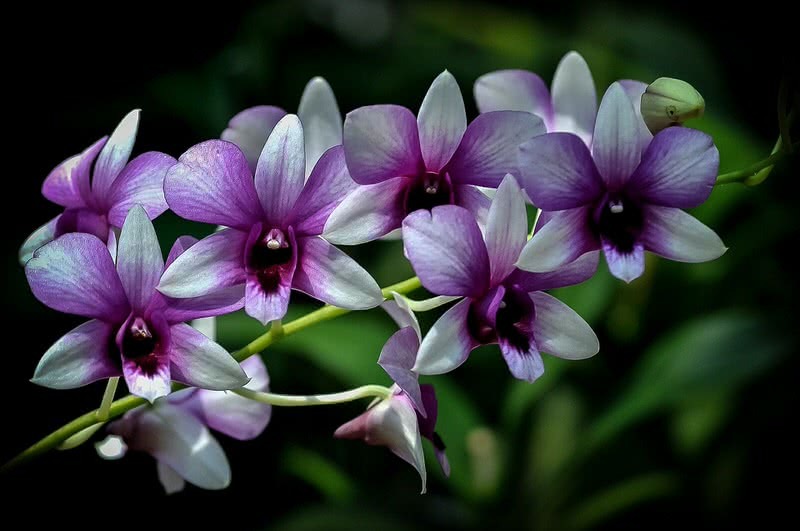 With more than 25000 known species, orchids are one of the largest flowering plant family in the world. You can spot this beautiful plant nearly everywhere on earth. But what makes orchids so special is each orchid species is unique. There are both large and small orchids, short living and long living orchids. Apart from these facts, the most highlighting features of orchids are their unique statutes and vibrant colors. Some species of orchids exactly look like other figures like animals or plants. For example, the laughing bumble bee orchid has a strong resemblance with a female bee. It helps the plant in pollination by attracting the male bees. In addition to the shape, vibrant colors also play a huge role in the stunning look of orchids. Each orchid flower cone in different colors, white and in the shades of pink, yellow, red and purple. The stunning colors of orchids also help in attracting the pollinators. Probably the most beautiful flower in the world. Humans have started to cultivate roses since 500 B.C. This pretty, pleasant-smelling flower has such a long time connection with us. Roses also symbolizes love, honor, faith, beauty, and passion. Beauty is the main factor that makes roses so popular among both florists and flower lovers. There are 100+ different species of roses in the world. The truth is every species of rose has its own unique beauty. 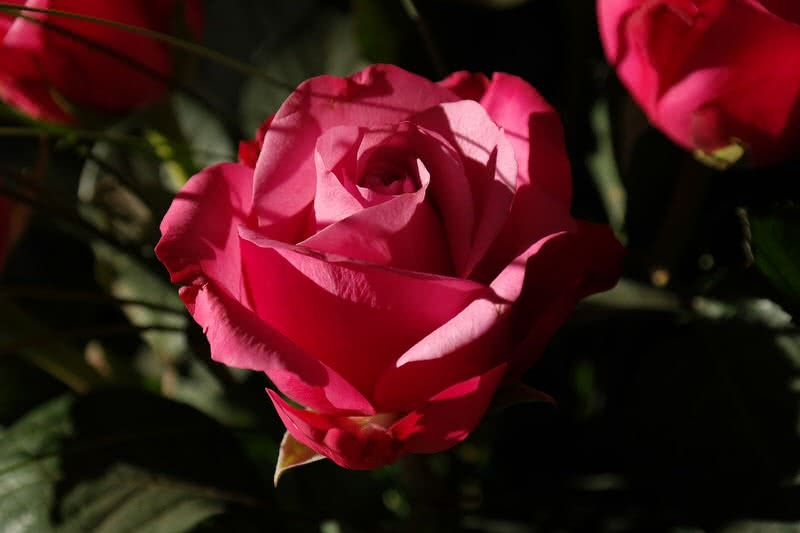 Naturally grown roses only have five petals and five sepals. The only exception for it is Rosa Sericea – this species of rose has only 4 petals. Roses can be found in different shades of red, yellow, pink, white and orange. Black and pure blue colored roses don’t exist. Regardless of the color, roses appear to be so attractive. Red roses are so special for us because it symbolizes true love.